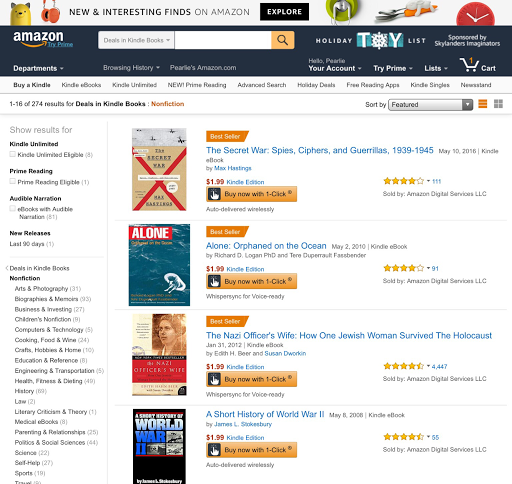 You have to checked out the non-fiction Holidays Deals in Amazon Kindle for the month of November. There are 274 titles on sale! There were only about 40-50 in the previous months. I have already purchased 14 books this month, and there are 21 more titles I am considering. Where in the world will I find the time to read all of them, I really don't know. But they are so interesting and affordable it is hard to stop myself. After all, I am a book collector, albeit electronic ones. My friends do challenge me in the sense that it is only when I buy print books that I can put them all on my shelves to show off my collection. But I beg to differ. No one will come to my house to see my shelves but anyone can now view my online shelf right here in www.goodreads.com/pearlie. I now have 946 books and counting, both print and electronic combined. I bet I will be reaching a thousand in no time at all.